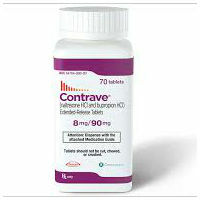 Contrave is a brand name weight loss medication that is typically prescribed to overweight individuals who are either obese or who suffer from weight-related health conditions such as diabetes, high blood pressure or high cholesterol. That being said, this diet drug is used for aiding in weight management and is not a treatment for actual medical problems related to excessive weight or obesity. There are two active ingredients in Contrave: bupropion and naltrexone. Bupropion is an antidepressant that can help restore the balance of neurotransmitters in the brain and may also help with appetite suppression. Naltrexone is an opiate antatgonist that may also help to control hunger and food cravings and is primarily prescribed to block the effects of alcohol or narcotics in individuals who suffer from problems with addiction. Essentially, when combined, these two drugs work on two distinct parts of the brain and help to lower appetite and reduce how much a person eats. Contrave is meant to be taken in conjunction with doctor-approved exercise, a reduced-calorie diet program and behavior change. It is an oral medication that is often taken twice daily with a low-fat meal. That being said, you should take this medication exactly as it is prescribed by your doctor. According to one study involving Contrave, those who took the drug and combined it with lifestyle changes lost 18 pounds on average at 56 weeks compared to the ll pounds lost by those who engaged in lifestyle changes alone. While the study showed that Contrave can lead to more weight loss compared to diet and exercise modifications alone, losing 18 pounds over the course of more than a year isn’t an overly impressive result, especially considering the side effects linked to this product. This medication can cause side effects. Some users have reported difficulty sleeping when they first start taking this drug. To help reduce the risk of sleep disturbances, you should not take your evening dose to close to your bedtime. In addition to difficulty sleeping, other side effects that may be experienced while taking Contrave include nausea, constipation, headache, dizziness, stomach pain, dry mouth, strange taste and increased sweating or flushing. Serious side effects that may occur include: mental or mood changes, uncontrolled movements, severe headache, fast or pounding heartbeat or irregular heartbeat, chest pain, ringing in the ears, fainting and seizures. If these or any side effects occur, contact your doctor immediately. This weight loss medication is not for everyone. Individuals who should not take this drug include those who have uncontrolled high blood pressure, an eating disorder, seizures, kidney failure or if you are breast feeding or pregnant. This medication should also not be taken by anyone who is taking narcotic medicine or other forms of bupropion. Tell your doctor about any health condition you may have (regardless of how sever or minor, past or present) and inform him or her of any medications (prescription or non-prescription) or supplements you may currently be taking. This entry was posted in Prescription Diet Pills Reviews and tagged weight loss on August 3, 2016 by Diet-Pills.cc.